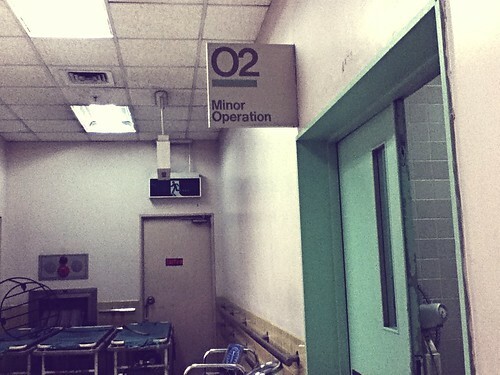 The first time I entered the Operating Room was the first time I was asked to do a minor surgery. Lennie Chua and Elizabeth Ching were assigned a patient with an epidermal inclusion cyst. Jegar Catindig, Marvyn Chan, and I were given a patient with four lipoma masses on his lower back. By the time the girls extracted the cyst, they hopped on to our cubicle and helped us out. We alternated in the excision and retraction, which took us a little more than three hours. The patient, a 50-something man, was in a good mood, but we could tell he was getting hungry. During the operation we talked about his children, his business, and what food he'd like to order for lunch. I personally saw him after the operation, when he was on his way out. "Kami po 'yung nagtanggal ng bukol ninyo (We were the ones who took the masses out)," I said. "Ah, oo nga, naalala ko 'yung boses mo (Oh, yes, I remember your voice)," he said. "Salamat, ha (Thank you)." Seeing patients happy and contented—oh, such joy. There aren’t enough thank yous to say to patients who line up at 3-4 AM in the OPD, who willingly or unwillingly let themselves be examined by students at 7:30 in the morning and wait another 3-4 hours before they’re seen by a consultant, without a word of complaint. That they could still sit patiently for so long, smile, and say thank you back is beyond me. I feel so incredibly humbled, sad, thankful, and motivated by what I’ve seen and experienced the past 2 weeks, and I’m not even in the more toxic rotations yet. K-ab and I miss you lance! AAce: At this point, I'm open to anything. Anonymous (may I know your name? ), it's probably a big challenge to keep that attitude, but we, as Dr. Alonso said in our Art of Med lectures, must do our best.